TICKETS ARE NOW SOLD OUT FOR THIS EVENT!!! See you & your friends there! Be sure to "Like" & "Share" above to help spread the word!! 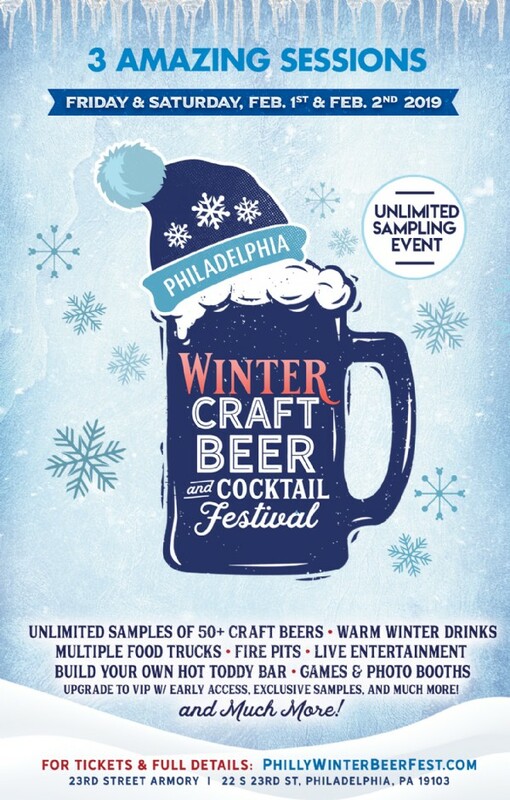 Join us - get warm and toasty at The Philadelphia Winter Craft Beer & Cocktail Festival! Grab your friends & co-workers and choose from three different sessions over two days filled with an amazing craft beer selection plus a chance to find your new favorite warm, winter cocktail! This winter-themed festival comes complete with unlimited samples from 30+ breweries (serving up a wide variety of the very best winter brews, IPAs, stouts, porters, lagers, barrel-aged brews, light lagers, and more), delicious local food trucks, specialty winter cocktails (including spiked hot chocolate, warm ciders, hot toddys, and more), live entertainment, games and contests, festive lights & decor, and tons of other fun activities in the spirit of the winter season! We are also encouraging everyone to bring coats & jackets you are not longer using for a winter coat drive for those less fortunate this cold, winter season. Coats will be collected as you enter the event. * Please see below for everything included with VIP Tickets. Second Floor = Welcome to the winter warmup lodge w/ live acoustic music! Be ready to have some fun! A commemorative sampling glass, great entertainment, vendors, games, giveaways and more! Exclusive sampling stations throughout the event for VIPs only! This event is not one to miss. Grab your friends and co-workers, join us after work on Friday for a fun late happy hour or on Saturday and choose from the early or later session. Either way, share this event on Facebook and we will see you there! !